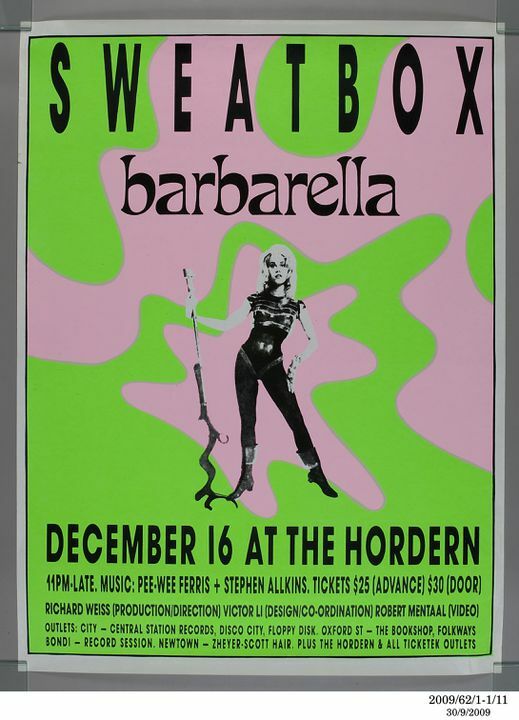 The objects in this archive were made by various producers to advertise, celebrate, document, and be used at Sweatbox, Mardi Grass and other rave, dance and gay culture parties and nightclubs in the 1980s and 1990s in Sydney, Australia. This archive of posters and other memorabilia was assembled over a decade from the early to mid 1980s to the early 1990s. It documents the rave, dance and gay culture nightclub/dance party scene that was a thriving subculture in that era. The donors were the creators, organisers and promoters of the Sweatbox parties, and also attended many other parties and nightclubs. The donors attended many dance parties in the 1980s, and decided they could organise much improved ones. The first party the organised was in February 1989. They called the parties Sweatbox; and they were designed to create a unique and emotive atmosphere. The donors formed an innovative and creative party design team. They designed the concepts, graphics, artwork - much of it designed on Letraset on lounge-room floors - and attained high standards in lighting and sound for the parties. Their reputation for creating dance parties with art and style was quickly established. They transformed dull, sterile spaces into uniquely themes party environments. Set Designer Paul Hinderer also made an important contribution to the set design of the first three Sweatbox parties. The very first Sweatbox was scheduled for a week after Mardi Gras. To publicise it, they created a float for the Mardi Gras Parade, and had it travel at the back of the entire parade. The first Sweatbox party was called Meltdown. Its aesthetic was industrial chic. The venue was the Hordern Pavilion in East Sydney. The foyer was transformed into the mouth of a cave from which a mine shaft led to the dance floor which was surrounded by three giant earth movers with lighting rigs attached. They donated this archive, along with other objects to the Powerhouse Museum in 2009 for use in research and exhibitions on popular culture and subcultures in the 1980s in Australia.